Let’s start this week with a reminder of one of the cardinal truths of Christianity; the fact that all are sinners, without exception. Yet, the 42nd chapter of Job does give us a little more insight to Job’s true situation. Monday, November 14th, Innocent Blood? Besides the clear testimony of Scripture, anyone who has ever known the Lord personally, who has seen a glimpse of God’s goodness and holiness, knows the reality of human sinfulness. In that sense, who among us … is truly “innocent”? These questions ignore what the lesson author has stated at the beginning of today’s lesson, and takes away the fact that we’re sinners in a fallen world, suffering the consequences of mankind’s sinfulness. Of course, life is unfair, yet if anything is unfair, it is the gospel of Jesus Christ. He, a perfect man, took our sins upon himself so that we might be his righteousness. He was beaten savagely, mocked and then underwent one of the most horrible of deaths, a death on a cross. And we, born into sin, sinners from the womb, get off “scot free” simply by believing the gospel. This is truly the most “unfair” fact in the universe. All the sins of humanity, every single one, were borne by him on the cross. God, in his great sovereignty, allows all that happens on this earth. There is a reason for it, it is simply that we do not know the reason. But to say that horrible things happening to sinful people is unfair, is to deny the sovereignty and wisdom of God who is alone perfect and without fault. 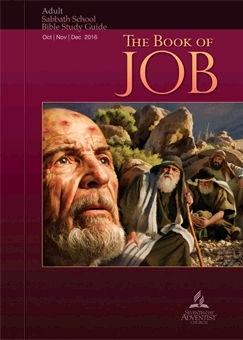 Why did Job repent? What wrong counsel did he offer in answer to his three friends accusations? Faithful Job, the believer, to whom horrible things were done, had to repent in dust and ashes. If Job repented, how much more might we need to repent, having been given the glorious revelation of God through Jesus Christ and his gospel? Repentance is not a one-time experience; Christians are always repenting, because we are so aware of our sinfulness. The Bible reflects a harsh fact about life in our fallen world: evil and suffering are real. It’s only a superficial reading of the Word of God, pulling a few texts out of the whole context, that could give anyone the idea that life here is fair and just and good, and that if only we remain faithful to God, suffering won’t come. Today’s prosperity preachers have not learned this lesson, or if they have, they are doubly evil. Adventism is guilty, too, because of the teaching of its health message. The message is that there are things that one shouldn’t eat to live a healthy and prosperous life. The so-called “blue zones” and the health studies that have attempted to present these areas where people live the longest is also troublesome. The studies are biased and do not show the complete picture of places like Loma Linda, California. The “health message” is not the right arm of the gospel. In fact, our physical health has little to do with our life experiences as Christians. It is God alone who gives life and he has numbered our days. Lam 4:18b our days were numbered, for our end had come. "I tell you, my friends, do not fear those who kill the body, and after that have nothing more that they can do. 5 But I will warn you whom to fear: fear him who, after he has killed, has authority to cast into hell. Yes, I tell you, fear him! 6 Are not five sparrows sold for two pennies? And not one of them is forgotten before God. 7 Why, even the hairs of your head are all numbered. Fear not; you are of more value than many sparrows. And if the hairs of our heads are numbered, then so our days are numbered as well. It’s good to prepare for the future, but worrying about the future only causes stress, anxiety and can lead to depression and other ills. As we have seen early in this quarter (see lesson 2), the great controversy template works well in helping us to deal with the reality of evil in our world. Yet he has been defanged and declawed; he makes a lot of noise, and still causes evil wherever he can. But we must not be afraid of any accusations the devil has made against God and his law, which we must somehow vindicate before a watching universe. Even if someone didn’t believe this promise or many of the others in the Bible, that person would have to admit, if nothing else, how much nicer life would be now, to have at least that hope, as opposed to the prospect of just living here amid our toils and struggles and then dying forever, with it all meaning nothing. If someone doesn’t believe the promises of God about the life in eternity, simply “hoping” that these promises are true without faith in Christ is creating a false belief system. Not believing in God’s promises is where the unbeliever lives. Those that have chosen Christ, have chosen because of the very fact that they will be delivered from the domain of hell and placed in God’s New Jerusalem following their resurrection. For the unbeliever, “dying forever” is an acceptable future that allows them to live this life with some level of comfort. However, spending an eternity in hell is another story. The truth of that fate for unbelievers would make a Christian desperately seek to present Christ and salvation in him to those who are lost. “dying forever, with it all meaning nothing” is Adventism’s answer to the fate of the lost. There are many, including some Adventists who are OK with the prospect of being wiped out forever, without any eternal hell to pay. Unfortunately, hell is just what Jesus warned about more than any other person in Scripture. Hell is a real place, where the lost will be tormented in the presence of the Lamb forever and ever. It is fear of hell that drives some to the salvation found in Christ Jesus. That is not a bad reason to be a believer, yet hopefully that believer would grow to realize God’s great promises of eternal life in God’s presence as being true and a great reason to live under the Lordship of Christ in this life. The “Teacher’s Comments” included in the Teachers version of the quarterly (p. 110) suggests that one look into Ellen White’s writings about the Waldensians. Rather than do that, get a concordance and do a search through the Bible of the promises of God for those who believe in him. That exercise would be very profitable and full of comfort that you can share with unbelievers to convince them of the loving-kindness of our God.